Multi ClipBoard slots works via the Clipboard, thus it is possible to keep the contents of the Clipboard while you stock the clipboard slots! It is best explained in a meaningful example! You use the clipboard slot one, with the keyboard shortcut Ctrl + 1 MulticlipBoardSlots sends the copy command to the foreground program (active window)! If the option "Restore the clipboard" is activated, the current contents of the clipboard are saved before the COPY command is sent to the program! to SLOT 1 and the old content of the clipboard will be restored, so you can use the old clipboard content. (Image-1) Restore the windows Clipboard! 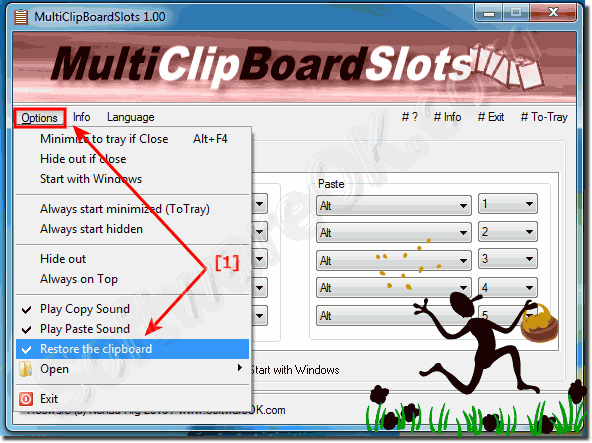 MultiClipBoardSlots - FAQ-3: What does restore the clipboard in Multi Clipboard slots on Windows 10 (8.1, 7)?